A lethal freestyle Rossignol snowboard binding, the Cobra features Elasti-Back technology, allowing wider freestyle stances, enhanced butter-ability, and better shock absorption. With 2.5° of inward canting, the Cobra relieves the stress of wider stances, providing increased nose and tail pressure for increased leverage, pop, and some serious freestyle bite. Rossignol&apos;s asymmetrical highback shape mirrors their canted footbeds to deliver enhanced fit and comfort no matter your stance angle or width. 3D AsymWrap Highbacks wrap around your boot both laterally and vertically, delivering consistent boot and binding contact for instant power transmission and stability. The MagneBed 2.5R uses a full length EVA footbed that has 2.5° of canting for better pop and endless butter, 3 specific foot receptor zone pads for shock absorption, as well as a dual density padding, an adjustable toe ramp and a patented magnetic closure system. The closer the toe ramp to your boot the more the precision of your ride. 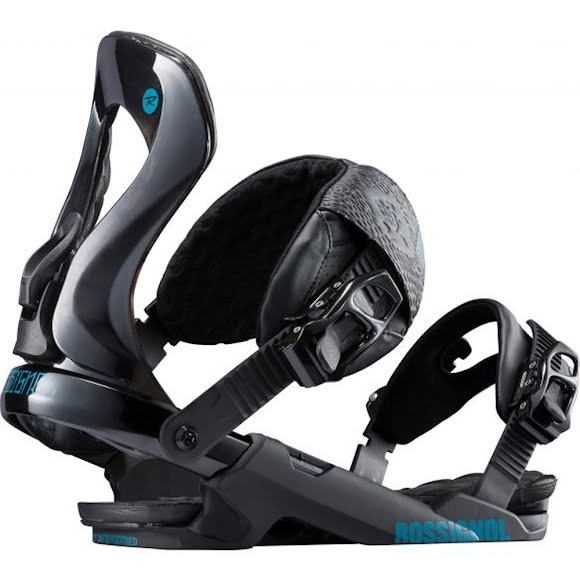 Rossignol has angled the ramps on a selection of their bindings, expanding the contact surface with your boot towards the toe box, opening the door to a new board feel. New for 13/14: the boot size shows on the side of the toe ramp for appropriate adjustment. Asym diecast aluminum construction for durability and lightness with the freewheel ratchets for quick entry and easy exit. Made with 76D shore polyurethane, instead of traditional Nylon, Elasti-Backs provide better flex and elasticity for greater tweak-ability and shock-absorption, and smoother response for increased comfort and performance. All MagneBeds and Triad Pads are made of a medial, toe and heel pad, so we&apos;re building each pad with a different Hardness value (Shore A) for specific function. Choose the best combination for your riding style and enjoy the blend of comfort and performance. 50A to 60A: enhanced reactivity with a medium to hard value on the medial/toe pads. 40A: increases shock absorption with a softer value on the heel pad.